People make a lot of effort in planning their wedding and the wedding invitation cards are one part of that massive stress. Once these cards have been selected, the last thing that anyone would want to do is to mark them up with some kind of numbers or even symbols in order to identify which RSVP card belongs to which person, because the worst part is when the reply comes back nameless. In fact, this will stress of your marriage plans as, now, you have no idea of who is attending and who is not. But now there is a super fun, as well as easy, way to keep your things in order when you are making your wedding plans. This is a quick and easy solution that will be able to put your mind at ease, so that you are able to take care of the other activities. • Use your PC and make an excel sheet in order to track your guests. 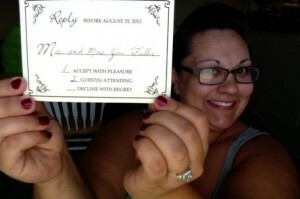 • Just make the guest list and assign a number to each guest. • Write these numbers with the invisible ink pen on the back of the wedding RSVP cards. This way you would be able to get an accurate estimate of the guests who would be attending the event. The back of this invisible ink pen has a special black light. With this, you will be able to see the number that you have written on the RSVP card. And the real fun is that your guests will never even know that they are being tracked. In fact, they will be quite surprised about all this when they come to the venue. For all the cost conscious people, this is a highly affordable invisible ink pen. Hence, even if you are using these only for the RSVP cards of your wedding, buying this pen makes a lot of economic sense. In addition, you can always use your ingenuity and use this pen for a lot of other functions too. Also, many guests tend to miss out telling on their meal preferences in RSVP cards. This is where knowing your guest through the guest list becomes very important. After all, guests should sit next to each other at the reception table. In the event that the meal preferences are not clear, it can be a big disaster. This is why this invisible ink pen can be a real help in organizing a perfect wedding. After all, everyone would want their wedding to be perfect event. But usually, this is due to negligence of other things become more difficult. So, it makes sense to be prepared for all kinds of eventualities.